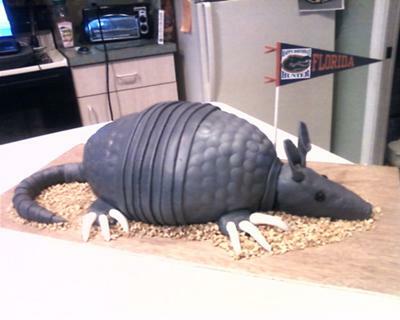 This Homemade Armadillo Birthday Cake was for a 16 Birthday Cake for a friend. The cake was Red Velvet cake, so when cut into it was red like blood. He loved it. The cake was created with the Wilton Football cake pan and a 9x 12 cake pan. The Football shape was placed on top of 9 x 12 to make higher and also can shape it more round on bottom. Pieces that were cut off were used to form face of Armadillo. Cake was covered with grey buttercream frosting before fondant was put on so that fondant would stick. Then made Marshmallow Fondant and colored grey. Left some white to form nails for feet (let dry). Two pieces of fondant rolled out to fit front of armadillo and back end of armadillo. The middle where strips of fondant layered to overlay each strip. Circles on body where made from the open end of a frosting tip and pushed lightly to indent. 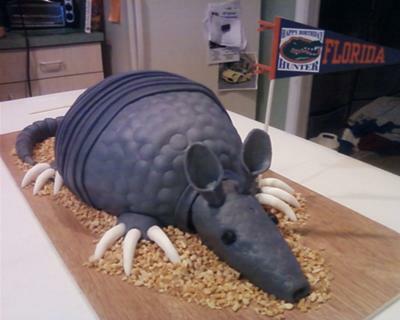 Face of Armadillo was a piece of cake cut into a long triangle and covered in fondant. An indentation was made on end to form snout. Ears were pieces of fondant shaped like a leaf, rolled and pinched around lollipop sticks to form tube shaped and inserted for ears. Eyes were black frosting. The tail was fondant wrapped around red licorice with strips of fondant to form segment look. Claws were inserted into pieces of fondant for feet, placed on each side of Armadillo. After cake was completed, placed toffee pieces around base to create rock look.